I have said it before, and I'll say it again; Josh Reynolds is the master of Age of Sigmar fiction, and he's proved it yet again with the quick read Auction of Blood. Tying into his upcoming Spear of Shadows novel, which I'll be grabbing this weekend, this short does a great job at establishing some serious atmosphere and getting you to care about it's main character in a rather short page count. I obviously can't go into too much detail without ruining the whole story considering how short it is, 35 pages, but I'll go over what I can. We meet our protagonist, Palem Bok, a collector of curiosities and local book shop owner in the Sigmarian city of Greywater Fastness. Right off the bat it's fascinating since we get another up close look at one of Sigmar's cities. This marks only the third time including City of Secrets and the story in the Shadows over Hammerhal boxed game that we've gotten to delve into these newest additions to the AoS background. Auction of Blood does not disappoint either, and you really get a feeling for how lived in this city is despite how new it may be to us. Josh does a great job at making it feel alive and real, with little tidbits like the Old Fen Gate, a pivotal location in our story, which is actually located rather inside the city's wall. At one point though, it marked one of the entrances to the city from the wilds of Ghyran, but has now been surpassed by the city's growth. Little things like this really add up in the atmosphere of the story. Bok himself is a great character as well, and I really hope we get to see more of him even though Josh said he's not in the Spear of Shadows book. He feels like a real, everyday kind of person, with nothing special about him besides his wit and a little expertise in a fight. The tiny bit of backstory we get on him does a great job at setting up the kind of morally loose character he is and leaves tons of room for further exploration later. You quickly learn that Bok does a little more than run a book store, and may owe a little of his success to his dark patron, the Queen of Mysteries herself. It's a task given to him by a missive of Neferata that sets the true plot of the story in motion. Sent to a seedy auction house near the previously mentioned Old Fen Gate, Bok must obtain an object of infinite interest to his mistress by any means necessary. It's here where the action kicks in, and a whole host of fascinating side characters are introduced. Some are merely window dressing, while my favorite, an elf "bouncer," gets a little more page time. Without spoiling anything else, I highly recommend you read this. 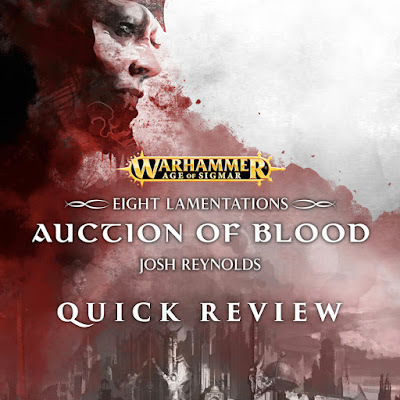 It's a great slice of low fantasy set within the high fantasy world of AoS that further ties into the expansive web of stories that Josh Reynolds is weaving. If you were a fan of City of Secrets I would definitely recommend this to you since it scratches a lot of the same itches. Also, there isn't a single Stormcast in sight, for those who wish to explore AoS without Sigmar's demigods around. I can definitely see Palem Bok carrying a series of books on his own and I really hope he does, or at the very least, guest stars in a few. This was another home run, and at only $4.99, a quick and enjoyable read. If you're an AoS fan it's well worth the price of admission.